194m3/hour maximum output, 42 metre 125mm (5") 5 stage multi-Z placing boom complete with twin wall pipework and squeeze valve. Two radio controls, 600 litre hopper capacity with aluminium cover and work lights. 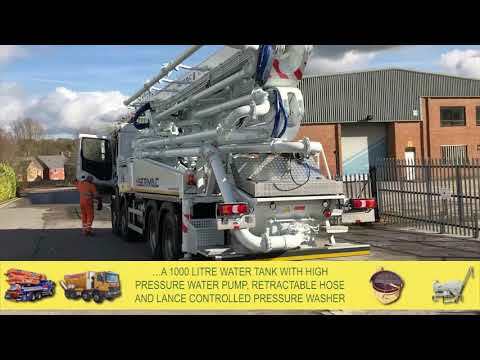 1,000 litre water tank capacity with high pressure water pump, retractable hose, lance-controlled pressure washer, 680 litre hydraulic oil tank, auto lube system. Powered by chassis-mounted reduction unit having a dual mounted PTO system with variable displacement pump and geared pump for auxiliary circuit. 4 hydraulic stabilisers with front 'X' opening and rear swing-out. Mounted on new/unused year 2019 Mercedes model Arocs 4151, LHD, 8x4, 32 ton gvw cab/chassis fitted with Mercedes 510bhp Euro 6 diesel engine. Complete unit painted white with complimentary delivery and training. With full warranty. Utranazz offer all concrete equipment either used, fully-reconditioned and repainted to customer specifications or in off-site condition. The majority of used equipment is from our own hire fleet and has a known service history. Equipment is usually no more than 3 years old and is kept in immaculate condition. NB: All prices quoted in Pounds Sterling, ex-works Buckingham, exclusive of VAT which (if applicable) will be added to the final invoice at the current rate.